Brad Pitt and Angelina Jolie may be a lot of things, but one thing they are not is greedy. The couple has given to charity for years, this time donating $1 million to the St. John’s Hospital cancer treatment center in Brad’s hometown of Springfield, Missouri. Doug Pitt, Brad’s brother, heads up the cause and says the money will go towards and endowment fund which pays for the services of kids in need of cancer specialists. The fund will also pay for a new pediatric unit, consisting of ten new units at the Ronald McDonald House based at the hospital; the expansion will double the existing space at the neonatal and pediatric intensive care units. It was also announced that the St. John’s Hospital cancer treatment center will be renamed the Jane Pitt Pediatric Cancer Center, after Brad and Doug’s mom. St. John’s Hospital will match the $1 million donation. A Malawi judge has ruled that Madonna is a fit mother and approved her bid to adopt 3-year-old Chifundo “Mercy” James. 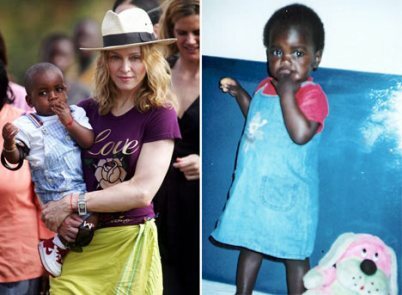 In 2006, Madonna adopted David Banda from Malawi, who was also 3-years-old. 50 queries in 1.129 seconds.